Leftunch apparently is where a "Lord Lhlendam" is buried. Hendor-Stardumz is in a place that the dwemer called "Chinzinch Pass" where there were creatures that killed Lhlendam. Bamz-Armschend was a dwemer Council Hall of some sort. Raled-Makei is plundered and probably has lots of scholars in there, as in it's a popular ruin to go to and would be deemed a safe one for the general public to visit and see the dwemer architecture up close. Would these ruins be in TR? They're all mentioned in the lore. I wouldn't mind making them if people don't want to make them. I seem to think that they would be in the Telvanni and Indoril Lands. Aside from Raled-Makei. That would probably be in close proximity to Cyrodiil so Hlaalu lands most likely. Bamz-Amschend is in Tribunal, though it's not entirely clear how and where we'll be reimplementing it. For the rest, I'd be sure to double-check that none of them are added already, because I know this has come up before, and old TR pretty regularly dug up and included such references in the project. Oh right yeah, forgot that was the ruin under mournhold. I can double check to make sure they are not in TR yet. I checked the interactive map to base the post on, bit I could check the main release esp and the preview esp just to make sure. Leftunch is a burial for Lord Ihlendam when he was killed by beasts at Chinzinch Pass, on his way to Hendor-Stardumz. Just want to get your opinion on this.These ruins should all be in TR. They are referenced in the Lore established in Morrowind. This is just my idea for placements, as the map (albeit outdated) shows dwemer ruins with no names. As the ruins already exist in-game and don't really have an exterior name, I'd be on board with that. Seems like a good thing to do. 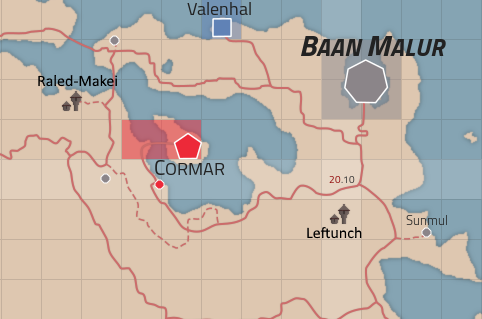 Norenen-Dur and Bamz-Armschend are additions to the map that I put there. But as Almalexia will get a redo later, these can come along with it. The other dwemer ruins are indeed already in TR_Preview and are nameless. So just naming the cell and interior those names is literally a 10 second job for each one. When the interiors are made that is. My only criticism is labelling Knocker's Neck Pass as Chinzinch Pass. 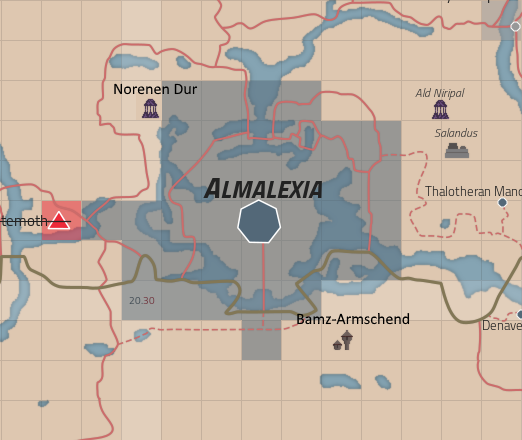 Applying the name to the northwestern pass out of (what was then not yet) the Armun Ashlands would probably make more sense. Lord Ihlendam is either a Dwemer or, perhaps, Chimer. Either way, it's unlikely he would have come from west of Knocker's Neck Pass, especially as the area would have probably still been crawling with Orcs. Beyond that, it looks like a good plan. Edit: ah actually, one other point: why did you put Leftunch way up north and Kherakah near Chinzinch Pass? I think it would make more sense to assume Lord Ihlendam was buried near where he died rather than being carted a significant way across the province. That makes sense actually. Yeah, I think I was meant to have those names as you said in those places but got confused looking between 3 maps lol. I actually did want Leftunch to be where Kherakah is. That was my bad. 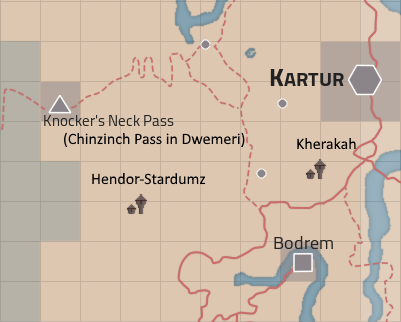 As for knockers neck pass, I wasn't wanting to rename it, it should stay as is. But yeah I didn't know what to do with Chinzinch pass. This is why I was looking for feedback so that it can make sense instead of just the blatant (could be this in dwemeri) rename that I did. Thank you for the suggestions though. I want to go with your ideas. I just wanted to start a conversation about all this really. Yeah, I know you weren't planning a name change for the pass, just an extra ancient name. No worries about starting these sort of conversations; there are a lot of aspects of the mod that I'd like to pay attention to but generally can't focus on, so having someone do and present the legwork as you have is really helpful. (Especially as you managed to keep it short and to the point, which I generally fail to do).